For other uses, see Arno (disambiguation). The river originates on Mount Falterona in the Casentino area of the Apennines, and initially takes a southward curve. The river turns to the west near Arezzo passing through Florence, Empoli and Pisa, flowing into the Tyrrhenian Sea at Marina di Pisa. The Casentino, in the province of Arezzo, formed by the upper course of the river until its confluence with the Maestro della Chiana channel. The Val di Chiana, a plain drained in the 18th century, which until then had been a marshy area tributary of the Tiber. The upper Valdarno, a long valley bordered on the east by the Pratomagno massif and on the west by the hills around Siena. The Sieve's basin, which flows into the Arno immediately before Florence. The middle Valdarno, with the plain including Florence, Sesto Fiorentino, Prato, and Pistoia. The lower Valdarno, with the valley of important tributaries such as the Pesa, Elsa, and Era and in which, after Pontedera, the Arno flows into the Ligurian Sea. The river has a very variable discharge, ranging from about 6 cubic metres per second (210 cu ft/s) to more than 2,000 cubic metres per second (71,000 cu ft/s). The mouth of the river was once near Pisa but is now several kilometres westwards. 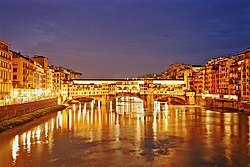 It crosses Florence, where it passes below the Ponte Vecchio and the Santa Trinita bridge (built by Bartolomeo Ammanati but inspired by Michelangelo). The river flooded this city regularly in historical times, most recently in 1966, with 4,500 cubic metres per second (160,000 cu ft/s) after rainfall of 437.2 millimetres (17.21 in) in Badia Agnano and 190 millimetres (7.5 in) in Florence, in only 24 hours. Before Pisa, the Arno is crossed by the Imperial Canal at La Botte. This water channel passes under the Arno through a tunnel, and serves to drain the former area of the Lago di Bientina, which was once the largest lake in Tuscany before its reclamation. The flow rate of the Arno is irregular. It is sometimes described as having a torrentlike behaviour, because it can easily go from almost dry to near flood in a few days. At the point where the Arno leaves the Apennines, flow measurements can vary between 0.56 and 3,540 cubic metres per second (20 and 125,014 cu ft/s). New dams built upstream of Florence have greatly alleviated the problem in recent years. The flood on November 4, 1966 collapsed the embankment in Florence, killing at least 40 people and damaging or destroying millions of works of art and rare books. New conservation techniques were inspired by the disaster, but even decades later hundreds of works still await restoration. From Latin Arnus (Pliny, Natural History 3.50). The philologist Hans Krahe related this toponym on a paleo-European basis *Ar-n-, derived from the Proto-Indo-European root *er-, "flow, move". ^ Alison McLean (November 2006). "This Month in History". Smithsonian. 37 (8): 34. This page was last edited on 24 January 2019, at 09:50 (UTC).